It's time to return to a favorite subject this Feel Good Friday. 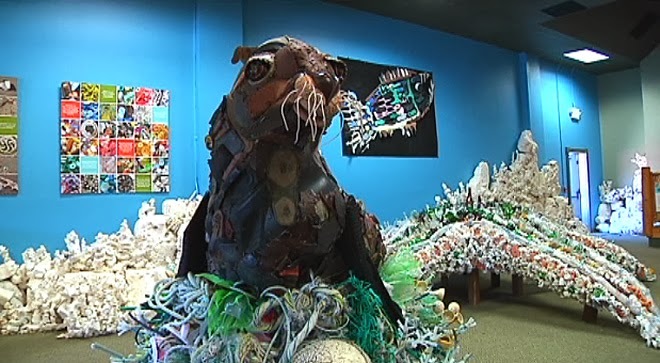 People turning plastic from the ocean into art to educate others about plastic pollution. Our first ever FGF post was about Tess Felix, an artist in Stinson Beach collecting plastic that washed up on shore and turning it into art. In the second Inspiration Safari episode we talked to Roz Savage, a woman who rowed the Atlantic, Pacific and Indian oceans solo to bring attention to plastic pollution. 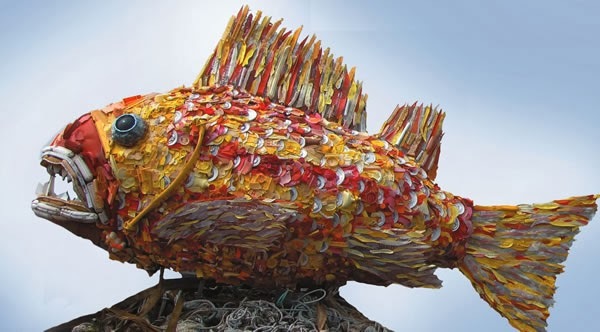 Today we're going to talk about Washed Ashore, a project that lets volunteers create large sculptures from plastic trash from the Oregon coast. Their mission, as stated on their website, is "to educate and create awareness about marine debris and plastic pollution through art." Founded and run by artist Angela Haseltine Pozzi, Washed Ashore is doing just that. In their first year, over 1000 volunteers to cleaned up 7000 pounds of trash and turned it into 18 large scale sculptures! In 2011 the exhibit came to the Marine Mammal Center in Sausalito. If, like me, you missed the exhibit when it came to California, there's hope. You can watch a 4 minute video explaining the project or a 10 minute excerpt from a longer documentary. More photos can be found on the Washed Ashore website and you can like their Facebook page to stay up on the latest and greatest news. As fantastic as all this art looks and as wonderful it is at getting the message about plastic pollution out, I look forward to the day when the artists run out of materials.